This low-calorie Costa Rican shrimp ceviche is the perfect appetizer or meal for meatless Monday! A typical Costa Rican cuisine recipe found on almost any menu and easily prepared at home! Ask any Costa Rican what food they most love to eat and most will rank ceviche in their top 5. There are many kinds of ceviche, and Costa Rica is definitely not the only country that counts ceviche as part of the national cuisine. But with so much abundant seafood in Costa Rica, it’s definitely a delicacy that is not to be missed on a visit to Costa Rica. You can find ceviche on almost any menu in the boca section- it is generally served as an appetizer. You can find shrimp ceviche, tilapia ceviche, red snapper ceviche, mixed ceviche… the possibilities are as endless as the types of fish found the area of Costa Rica in which you are staying. Ceviche is a dish that sort of combines a salsa/pico de gallo with fish and lime juice. In a very traditional ceviche the fish, shrimp or other seafood is actually cooked in the lime juice. That means raw fish is used to prepare the dish, and then the lime is left to marinate the fish until it is “cooked.” This dates back to pre-refrigerator cooking I am sure. 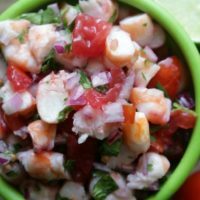 Where Can I Eat Shrimp Ceviche In Costa Rica? Because of this- when you are in Costa Rica and looking to eat ceviche, definitely follow your gut and your nose. While there are so many great places to eat delicious and fresh ceviche, there is also an opportunity for “bad ceviche.” Which I can also promise you- every Costa Rican has a “rotten ceviche” story too. Definitely make sure to smell the ceviche first, and if anything tastes off just don’t eat it. 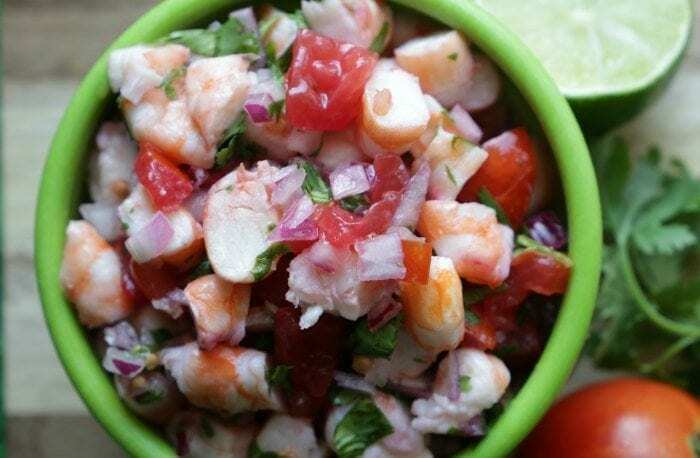 I love ceviche because it is packed with flavor and protein but also very low calorie. Costa Ricans will generally eat it accompanied with fresh tortilla chips and will squeeze ketchup and mayonaise on top. I like to eat it on top of greens with a bit of ranch dressing as a quick and easy salad for lunch. I also am known to top mine with guacamole… the possibilities are endless! Here’s the easy recipe for low calorie Costa Rican shrimp ceviche- and don’t forget to check out our other Costa Rican appetizer recipes! 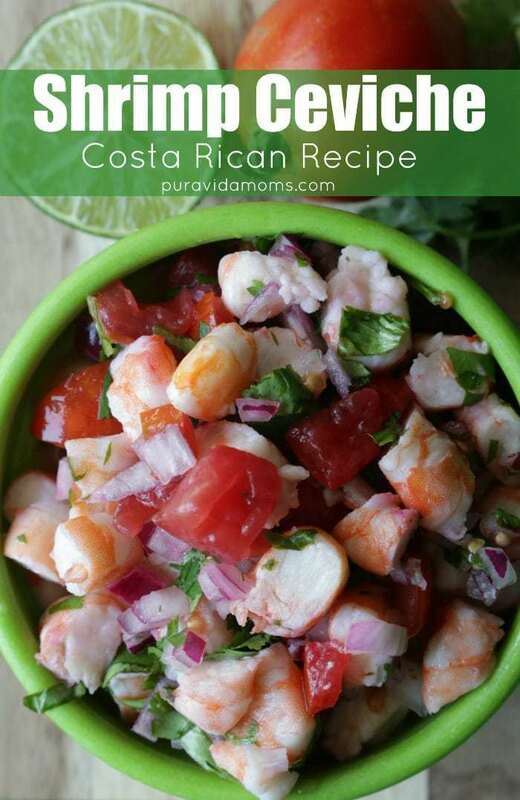 This low calorie Costa Rican shrimp ceviche is the perfect appetizer or meal for meatless Monday! A typical Costa Rican cuisine recipe found on almost any menu and easily prepared at home! Slice each shrimp into 3-4 pieces. Finely chop the cilantro leaves and red onion. Add all to a large bowl and combine. Sprinkle with salt and pour lime juice over the top. Cover and place in the refrigerator for 2-3 hours before serving to let the flavors blend. This dish is traditionally served cold in a small dish with fresh tortilla chips and ketchup and mayonnaise on top. This recipe stores well in the the refrigerator, covered, for up to three days. Costa Rican shrimp ceviche must be kept cold.